Thallium is the heaviest member of Group 13 on the periodic table, a family that consists of the post-transition “poor metals.” The element is a metal that has a low melting point and is extremely malleable, soft enough to be cut with a knife. Pure elemental thallium is initially lustrous and silvery-gray; however, immediately upon exposure to air the metal begins to form a dull bluish-gray film of thallium(I) oxide on its surface. Prolonged exposure converts the film to a dark brown crust of thallium(III) oxide. When submersed in water, the oxide film disappears and the metal regains its original sheen. Prolongued air and water contact converts the metal to thallium hydroxide. Thallium metal is highly reactive with oxygen and acids and dissolves in nitric acid. French chemist Jean-Baptiste Dumas once called it the "ornithorhynchus paradoxus of metals” (the platypus of metals) because of its similarity to several widely varying elements: lead, silver, potassium, mercury, among others. There is some debate as to whom the credit for discovering thallium should go. English chemist Sir William Crookes assumed he had obtained tellurium as a byproduct after isolating selenium from residues of sulfuric acid production. When he repeated his experiment years later in 1861, this time focusing on isolating tellurium, he was surprised by the unfamiliar brilliant green lines that appeared in the emission spectrum after burning the sample. This method, known as flame spectroscopy, had been invented several years earlier by chemists Robert Bunsen and Gustav Kirchhoff and used to discover several elements including cesium and rubidium, which they named based on Latin descriptions of the colors of their spectral lines. Fittingly, Crookes named his new element thallium after thallos, Greek for “green twig” or “shoot”. Around the same time, if not earlier, French chemist Claude-Auguste Lamy had identified the element independently from Crookes and isolated it one year later; Lamy, in fact, was more successful at producing the metal than Crookes, exhibiting a pure ingot of thallium at the 1682 London International Exhibition compared to the small amount of powder that Crookes had struggled to produce, and was awarded a medal. Despite this, the discovery of thallium is officially attributed to Crookes thanks to his vocal protest of Lemy’s award. Thallium is quite scarce in the earth’s crust, at about 0.7 mg/kg, roughly as common as iodine or tungsten. Thallium is not found free in nature, but rather is present in small amounts in ores of iron, copper, heavy-metal sulfides, and in polymetallic rock deposits on the ocean floor. Minerals that contain thallium include crooksite, lorandite, hutchinsonite, pyrites, and orpiment; carlinite (thallium sulfide) is one of the few primarily thallium-based minerals present on earth. Naturally-occurring thallium is composed of two stable isotopes, thallium-203 and -205. 23 radioactive isotopes have also been been synthesized. Thallium’s two oxidation states of +1 and +3 (thallous and thallic, respectively) form compounds with very divergent chemical behavior. Thallium(III) compounds and ions resemble those of boron. Thallium(I), the more common form, exhibits behaviour similar to that of the the alkali metals and is typically present in potassium ores. Commercially, the element is obtained as a gaseous byproduct of lead and zinc refining, or in the process of obtaining sulfuric acid from pyrites. Applications for thallium are mostly limited to the fields of electronics, medicine, and infrared optics. Formerly, one of its primary commercial applications centered on thallium sulfate, a toxic, colorless and odorless substance used as a rodenticide; unfortunately, thallium sulfate is also highly toxic to humans, and a string of accidental poisonings led the United States to ban the substance in 1975 in favor of safer alternatives. Thallium in nearly all of its forms is toxic and potentially carcinogenic, and it must be handled with extreme care; the +1 oxidation state’s similarity to alkaline metals causes the ions to be taken up by the cellular potassium ion pumps. Despite this danger, the radioactive isotope thallium-201 is frequently used in medicine in scintigraphy-type stress tests to diagnose clogged arteries and heart disease. 201-Tl binds to heart tissue only with an adequate supply of blood and is quickly eliminated from the patient’s body, emitting gamma particles that can be detected with a scintillation detector and subsequently analysed to determine the robustness of the heart. Some thallium(III) salts are also used as reagents in laboratory science, and thallium hydroxide is a strong base used in the synthesis of organometallic compounds. Thallium iodide in combination with iodides of indium, sodium, scandium, dysprosium, and occasionally tin, are used to produce the high-efficiency white light of metal halide lamps. In addition, certain alloys of thallium are used in bearings, and contact points, and soluble thallium salts serve as additives to gold plating baths to improve the grain size and expedite the plating process. Thallium has multiple uses in the field of advanced optoelectronics including infrared optics, phosphors, and specialty glasses. The high refractive index of the optical crystals thallium bromoiodide (KRS-5) and thallium bromochloride (KRS-6) make them ideal materials for attenuated total reflection prisms, lenses, and windows in infrared spectrometers and, like other thallium halides, can be used to manufacture fiber optics. Various phosphor and scintillator materials contain thallium either as in compound form, as in thallium selenide, or as host or activator, as in thallium-activated potassium chloride and thallium-activated sodium iodide. Photoelectric cells, photoresistors, and infrared detectors benefit from thallium sulfide’s ability to change electrical conductivity when exposed to infrared radiation; thallium chloride and thallium bromide have also been shown to be photosensitive. Thallium increases the refractive index of glasses; thallium(I) oxide is one material that has been used to fabricate optical glasses in combination with substances like germanium oxide and tellurium, and shatter-proof low melting glasses that become fluid at 125-150 degrees Celsius have been fabricated from thallium in combination with sulfur, selenium, or arsenic. Thallium compounds have other special properties that give them unique uses. A eutectic thallium-mercury alloy with 8.5% thallium is exhibits a melting point 20 degrees below that of pure mercury, making it applicable in low-temperature thermometers. Strongly basic thallium hydroxide has the ability to take up carbon dioxide from the atmosphere,. 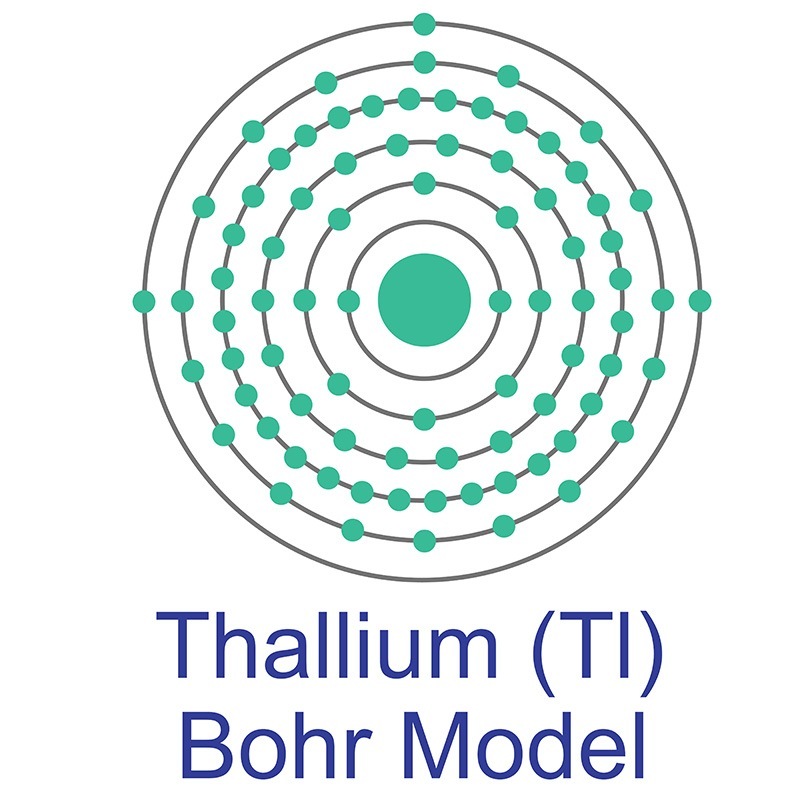 Thallium is the only known impurity that causes lead telluride (PbTe) to exhibit superconductivity; the resulting thallium-substituted lead telluride, PbTe:Tl, is a semiconductor and thermoelectric material. Other superconducting materials like thallium barium calcium copper oxides (TBCCO) and various thallium cuprates exhibit T c as high as 127 K.
Thallium is used most often in the form of thallium sulfide, a compound whose conductivity changes upon exposure to infrared light. This property makes the compound useful in photocells. Thallium bromide-iodide crystals have been used as infrared optical materials. Thallium has also been used with sulfur, selenium or arsenic to produce low melting glasses which become fluid between 125° and 150 C°.These glasses have properties at room temperatures similar to ordinary glasses and are said to be durable and insoluble in water. Thallium oxide has been used to produce glasses with a high index of refraction, and is also used in the manufacture of photo cells. Oxides are available in forms including powders and dense pellets for such uses as optical coating and thin film applications. Thallium is also available in many other specific states, forms and shapes including pellets, rod, wire and granules for evaporation source material purposes. Thallium is a post-transition metal that is not found free in nature. It is a Block P, Group 13, Period 6 element. The number of electrons in each of Thallium's shells is 2, 8, 18, 32, 18, 3 and its electron configuration is [Xe] 4f14 5d10 6s2 6p1. The Thallium atom has a radius of 170.pm and its Van der Waals radius is 196.pm. In its elemental form, CAS 7440-28-0, thallium has a silvery white appearance. Thallium was first discovered by Sir William Crookes in 1861 and gets its name from the Greek word "thallos" which means twig or green shoot. Thallium is produced from trace amounts that are found in copper, lead, zinc, and other heavy-metal-sulfide ores. Thallium information, including technical data, safety data, high purity properties, research, applications and other useful facts are discussed below. Scientific facts such as the atomic structure, ionization energy, abundance on earth, conductivity and thermal properties are also included. Thallium and its compounds are highly toxic. Safety data for thallium metal, nanomaterials, and compounds can vary widely depending on the form. For potential hazard information, toxicity, and road, sea and air transportation limitations, such as DOT Hazard Class, DOT Number, EU Number, NFPA Health rating and RTECS Class, please see the specific Thallium material or compound referenced in the Products tab. The below information applies to elemental (metallic) Thallium. Acute Tox. 2 H300 Fatal if swallowed. H300+H330 Fatal if swallowed or if inhaled. After inhalation Seek medical treatment in case of complaints. After skin contact Generally the product does not irritate the skin. After eye contact Rinse opened eye for several minutes under running water. If symptoms persist, consult a doctor. After swallowing Do not induce vomiting; immediately call for medical help. Environmental precautions: Do not allow material to be released to the environment without proper governmental permits. Information about storage in one common storage facility: Do not store together with oxidizing and acidic materials. Flammability (solid, gaseous) Not determined. Carcinogenicity: EPA-I: Data are inadequate for an assessment of human carcinogenic potential. Specific target organ system toxicity - repeated exposure: May cause damage to organs through prolonged or repeated exposure. Special precautions for user Not applicable. Thallium (Tl) has 37 isotopes with atomic masses ranging from 176 to 212. Only 203Tl and 205Tl are stable.